Never Yet Melted » Slavoj Žižek Endorses Trump! 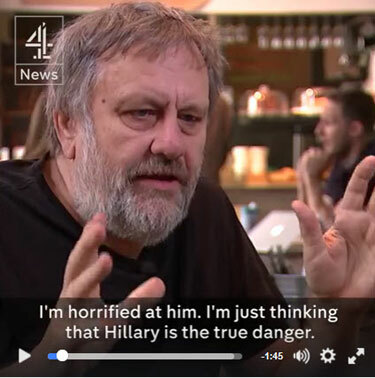 One Feedback on "Slavoj Žižek Endorses Trump!" Europeans fear right wingers because they don’t understand there is a virtually 180 degree difference between the European right wing which is just another form of authoritarianism and the American right wing which is dedicated to the reserve–personal liberty. Besides which the Fascism they fear is not a right wing phenomenon but just another form of autocracy of which the leftists are the finest practitioners. And it’s not at curious that the Europeans fail to recognize the true Fascist impulse in one Barack Obama who has pushed executive orders through a feckless Republican opposition in name only. ROINOS? The white supremacy boogie man is one that only empty headed American journalists and the people who believe them can possibly put any credence in. Everyone who ascribes white supremacy and bigotry to the notion we should control our border should have to live in a bad neighborhood not only with no locks, but no doors nor windows. And yes there are bad neighborhoods composed solely of whites. His conclusion is correct even though his reasoning is wrong. Trump over Hillary. In truth though, there’s no potential candidate who would impel me to vote for her. I might choose not to vote, but never for her. Like many people I keep asking what she has accomplished in her entire career, and today if finally came to me. She has successfully evaded prosecution and incarceration for a lifetime of criminal conduct.